Connect three CTS tubes to each other with these tees. Spears EverTUFF fittings are incredibly versatile and durable. 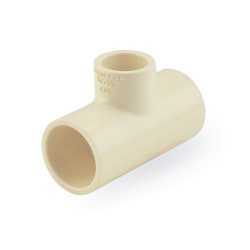 We offer many different types of fittings for all plumbing systems. This equal tee fitting connects three 1/2" CTS CPVC pipes toge.. The 4101-094 from Spears is a 3/4” x 1/2” x 1/2” CPVC CTS Reducing Tee (Socket). It connects 3/4" (s.. This equal tee fitting connects three 3/4" CTS CPVC pipes toge.. The 4101-101 from Spears is a 3/4” x 3/4” x 1/2” CPVC CTS Reducing Tee (Socket). It connects 3/4" (s.. The 4101-010 from Spears is a 1” CPVC CTS Reducing Tee (Socket). It connects three 1” CTS pipes in a..